NOTES: For the Eduard 1/72 kit. 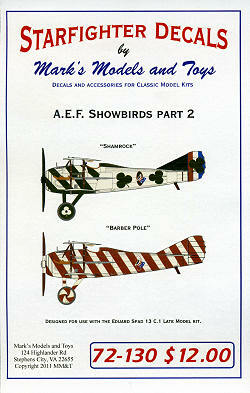 After WWI, the American Expeditionary Force painted up at least two Spad 13s from the 94th Pursuit Squadron to put on flying displays while on occupation duty during 1919. Starfighter decals has done a lot of research to bring these markings to you. These are designed for the Eduard Spad 13C.1 (late) and provide all the markings you'll need to do these two planes. The sheet includes all the stripes and other unique markings as well as insignia and tail bands for both planes. The two schemes are called 'Shamrock' and 'Barber Pole'. The decals themselves are superbly printed by Cartograf so you know you are getting one of the best in the industry. Extensive information is provided as both planes will need to have specific kit parts attached to properly do these. Some minor modifications are also required and that is detailed in the instructions. 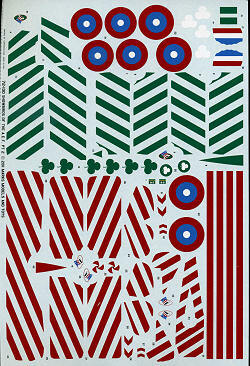 In all, this is really a great sheet for 1/72 modelers who would like something a bit on the flamboyant side. Thanks to the specific application guide, it should be a very straight-forward application. Thanks to www.starfighter-decals.com for the review sample. Get yours direct from the link.